Pro football games have been played in all sorts of weather conditions, and when it comes to the NFL postseason that has typically meant frigid temperatures and/or snow. 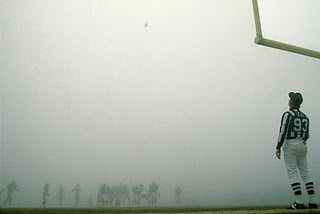 The NFC Divisional playoff game on December 31, 1988 was distinctive, however, for the ghostly fog that enveloped the field during the second half and that resulted in the contest being referred to as “the Fog Bowl”. The host team, the Chicago Bears, had placed first in the NFC Central with a 12-4 record. Under Head Coach Mike Ditka, it was the fifth consecutive season that the club had won in double figures and included a championship in ’85. Defense had been the key to Chicago’s success, and while free agency and injuries had caused some damage, mainstays such as tackles Steve McMichael and Dan Hampton, LB Mike Singletary, and SS Dave Duerson were still around and the unit had allowed an NFL-low 215 points. Injury-prone QB Jim McMahon had gone down at midseason, but backup Mike Tomczak was competent in relief and third-year RB Neal Anderson generated 1106 yards on the ground. The visiting Philadelphia Eagles, under third-year Head Coach Buddy Ryan (no stranger to the Bears, as he was the defensive coordinator during the Super Bowl season), had not been in the playoffs since 1981. 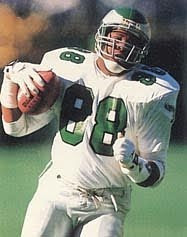 They had won the NFC East with a 10-6 tally and featured a tough, blitz-heavy defense, led by DE Reggie White. The offense was directed by highly-mobile QB Randall Cunningham, who threw for a team-record 3808 yards and ran for 624. Rookie TE Keith Jackson (pictured at right) had an All-Pro season, catching 81 passes, and RB Keith Byars, a better receiver out of the backfield than runner from scrimmage, grabbed 72. There was no clue at the game’s commencement of what lay ahead. The weather at Chicago’s Soldier Field was clear and temperatures were in the mid-30s at kickoff. The teams traded punts with the Bears scoring first, on their second possession. On a third-and-seven play, Tomczak connected with WR Dennis McKinnon for a 64-yard touchdown. The Eagles came right back as Cunningham completed passes of 15 yards to WR Mike Quick and 17 to WR Cris Carter to the Chicago 33 yard line. But the drive stalled at the 25 and a 43-yard field goal attempt by Luis Zendejas missed to the left. Philadelphia got a break, however, when Tomczak went to the air and was intercepted by LB Seth Joyner, giving the Eagles the ball at the Bears’ 30. Following a run by FB Anthony Toney, an 18-yard pass play from Cunningham to Jackson got the ball down to the 11. But after advancing to the nine, two successive apparent touchdown passes were wiped out by holding penalties on Toney. The Eagles ended up with a 43-yard Zendejas field goal. Now it was Chicago’s turn to mount a drive, and thanks to two Tomczak completions to McKinnon of 14 and 22 yards, the Bears got to the Philadelphia 34. However, Kevin Butler’s 51-yard field goal attempt fell short. The score was 7-3 at the end of the opening period. The Eagles got another break in the second quarter when Chicago TE Cap Boso fumbled after catching a pass from Tomczak and FS Wes Hopkins recovered for Philadelphia at the Bears’ 14. But on a third-and-seven play, Jackson dropped a pass in the end zone and the Eagles again had to settle for a 29-yard Zendejas field goal. Chicago’s next possession resulted in a four-yard touchdown run by Anderson that extended their lead to 14-6. It was 17-6 shortly thereafter as Butler kicked a 46-yard field goal. The Eagles got the ball back with just under two minutes remaining in the half, and a 65-yard pass play from Cunningham to Jackson got the ball down to the Chicago five. Once again, a penalty backed the Eagles up and they were unable to get a touchdown in the red zone. Zendejas kicked a 30-yard field goal and the score was 17-9 at halftime. On the field, the Eagles took the second half kickoff and again drove deep into Chicago territory, but with the ball at the 11 yard line, Cunningham was intercepted by CB Vestee Jackson, who returned it 51 yards. This time it was the Bears coming up empty in scoring position as they drove to the Philadelphia 13 and Butler’s 33-yard field goal attempt was no good when it hit the right upright. Later in the third quarter, Eagles SS Terry Hoage intercepted a Tomczak pass to give Philadelphia excellent field position at the Chicago 17. But after three incompletions, Zendejas kicked his fourth field goal of the game, from 35 yards. The Bears, with Jim McMahon replacing the injured Tomczak, drove to a 27-yard Butler field goal early in the fourth quarter. The Eagles had two more possessions, but were unable to score again. The last series, that made it to the Chicago 16, resulted in an interception by CB Maurice Douglass that was returned 47 yards, and from there the Bears were able to run out the clock and win by a score of 20-12. Philadelphia outgained the Bears (430 yards to 341) and had the edge in first downs, 22 to 14. Chicago turned the ball over more times (4 to 3), but untimely penalties and the inability to score touchdowns proved fatal – likely moreso than the weather conditions. The Eagles were inside the Chicago 26 yard line 10 times and came away with just four field goals. Mike Tomczak completed 10 of 20 passes for 172 yards with a touchdown and three interceptions. Dennis McKinnon caught four passes for 108 yards and a TD. RB Thomas Sanders rushed for 94 yards on 8 carries, while Neal Anderson ran the ball 14 times for 54 yards and a score. Randall Cunningham (pictured above) threw 54 passes and completed 27 of them for 407 yards, but was picked off three times. Keith Byars caught 9 of those throws for 103 yards while Keith Jackson gained 142 yards on 7 receptions and Mike Quick added another 82 yards on 5 catches. The Eagles had just 52 yards on the ground, with Byars gaining 34 of them on 7 attempts. The Bears were handily defeated by the 49ers in the NFC Championship game. Philadelphia made it back to the playoffs in each of the next two seasons under Ryan, but failed to win any games. 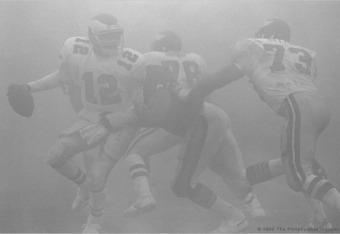 Many Eagles fans believed long afterward that the club’s best chance of making a Super Bowl run during this particular era disappeared in the fog at Soldier Field. I remember watching this game with a broken ankle, after playing street football earlier that day and stepping in a hole. Painful memories.